It may seem to be easy to erect and use scaffolding safely, but every year thousands of accidents occur on scaffolding - many of them caused by falling objects, slipping or by a loose support. The safe erection and use of scaffolds is overseen by OSHA (Occupational Safety and Health Administration) who has a long list of requirements to ensure that a scaffold is a safe place to work. Ideally, scaffolding should be erected on level ground - or as close to level as it is possible. Scaffolding should be constructed so that it is able to withstand at least four times its intended load. Always use firm supports for scaffolding - never use unstable objects such as bricks, boxes or barrels. 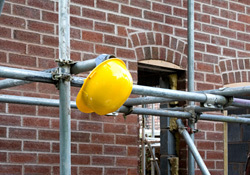 Be especially careful if erecting scaffolding on ground subject to flooding or subsidence. Erecting a scaffold is fairly straightforward - the basic structure consists of the base plate (supports) the vertical poles (standards) and horizontal poles. (ledgers) Across the ledgers are laid supports known as transomes - these will support the actual planking. In addition to the horizontal and vertical supports, you should also use diagonal supports in between the standards, which are known as cross braces. These parts are then joined together by metal tubes known as couplers. OSHA has many guidelines concerning the dimensions of these various parts. Once you have the basic scaffold in place, you will then need to add toe-boards - a plank of wood approximately 6 inches high, and attached at right angles to each platform. You will also need guard rails and perhaps mesh or a safety net to catch falling objects, or to prevent workers being hurt by falling objects. Although a scaffold should be able to easily bear four times its intended weight, never store materials or tools that you don't immediately need on a scaffold. And don't forget one of the most important parts of any scaffold - the securing of the scaffold to the adjacent building or structure. This is usually done with ties - the general rule is to attach a tie every 12 feet or so. There are different types of ties, depending on the size of the scaffolding and its intended weight. Through ties are put through openings in the structure, such as windows, anchor ties are fitted into drilled holes in the adjoining structure and box ties attach to a column or other feature. If your project involves two or more scaffolds, you should make sure that both of them are secured to the building or another permanent structure - and not attached to each other. And scaffolds should never be moved horizontally, altered or dismantled while in use. Never cut corners when erecting scaffolding - a properly erected scaffold will allow you to finish the job efficiently and safely.